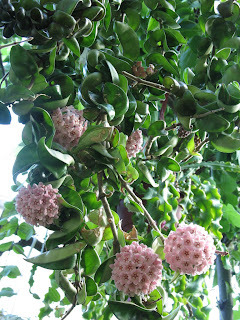 Devoid Of Culture And Indifferent To The Arts: Gardening: Ahoy, Hoya! Often when we are out walking Henry we walk past a house that has a hanging plant in the window of their Victorian enclosed porch. It looks like plump, green ruffles pressed tight together along the entire stem. Kind of like a "scrunch" some women use to hold back their hair. It is quite healthy, and quite long, trailing along two windows from its hanging pot. This is unusual enough, but when it flowers…. The flowers are packed tight, deep red, semi-spherical and resemble a pincushion with little pin heads just at the surface. We had never seen anything like it, before or since. So, of course, I went looking online, but couldn't find a thing visually. It's not surprising, since it was a complete shot in the dark. It wasn't until the owner was outside one time when we happened by we were able to ask. 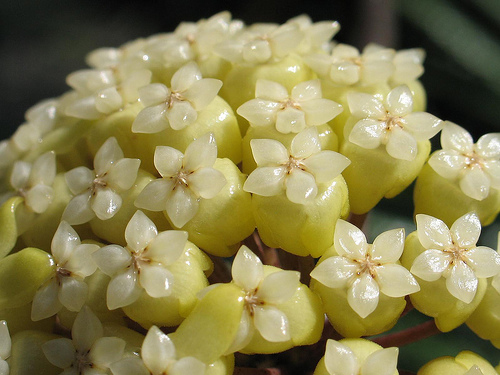 "It's a hoya," she said. I'd never heard of it, but an exotic looking thing it is. Its only rival of "indoor" flowers I have seen in Nova Scotia is the orchid. The window in which it hangs is North facing, but does get morning light for about four hours, if my reckoning is correct. 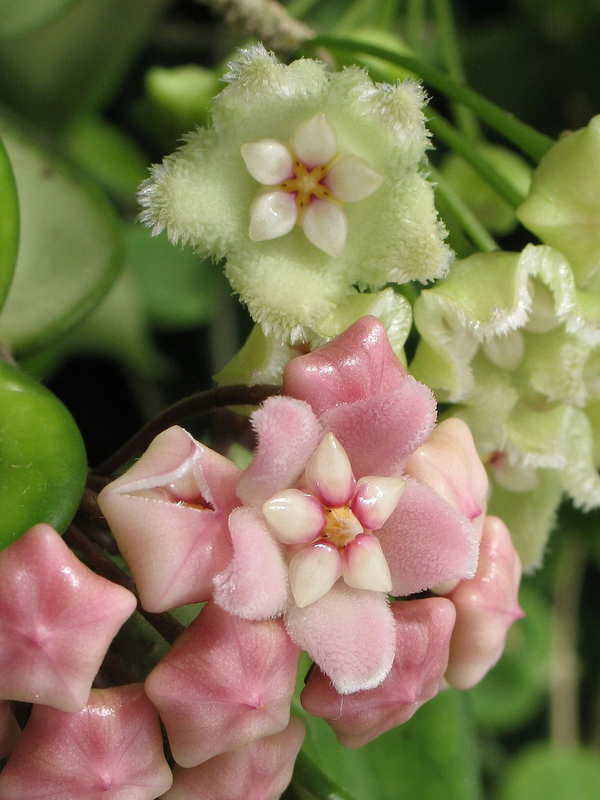 Hoyas (sometimes called Wax flowers or Wax vines) are tropical climbing plants native to Southeast Asia. 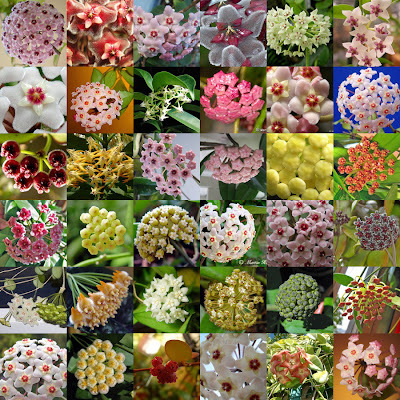 The genus has between 200-300 species. They are evergreen and can grow between 1-10 metres with support. Hoya have thick, shiny, and fleshy leaves which store water and clusters of waxy, star-shaped flowers. 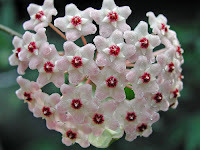 Each flower is about 1 cm across, and form in "umbrels". Colours range through red, pink, yellow and white. There are no blues. The plant was named by Robert Brown (1773-1858), a famous Scottish botanist. He named the genus for his friend and fellow botanist Thomas Hoy, head gardener for the Duke of Northumberland at Scion House, England. It is best to let these plants get dry between watering. The foliage will wrinkle if not enough water and if too much, light brown spots and or whole thick yellow leaves will occur. They will continue to bloom if they get good sunlight for most of spring and summer. New growth first appears as a leafless vine. The leaves slowly emerge. Feed once a month. Hoyas can grow very fast and will wrap around themselves other plants or whatever they can find. Turn periodically for even growth. You can keep them under control by cutting back. Make your cuts flush with a leaf. If you chose to keep them small and compact they will not bloom much. Hoyas are available in Canada by mail order from a small supplier in Saskatchewan. They have no online presence or capacity to accept online transactions. So a cheque or money order is the way to go. This is the Hoya we saw in the window. If you call they'll fax you a list of what they have. I called last year but they weren't ready to ship, and I forgot to call back. I will this year. If you wish to purchase online, good luck. To import any plant from another country into Canada you will need a Phytosanitary Certificate from the Canadian Food Inspection Agency. The certificate ensures that the plant is free from quarantine or other injurious pests. Phytos are not cheap. 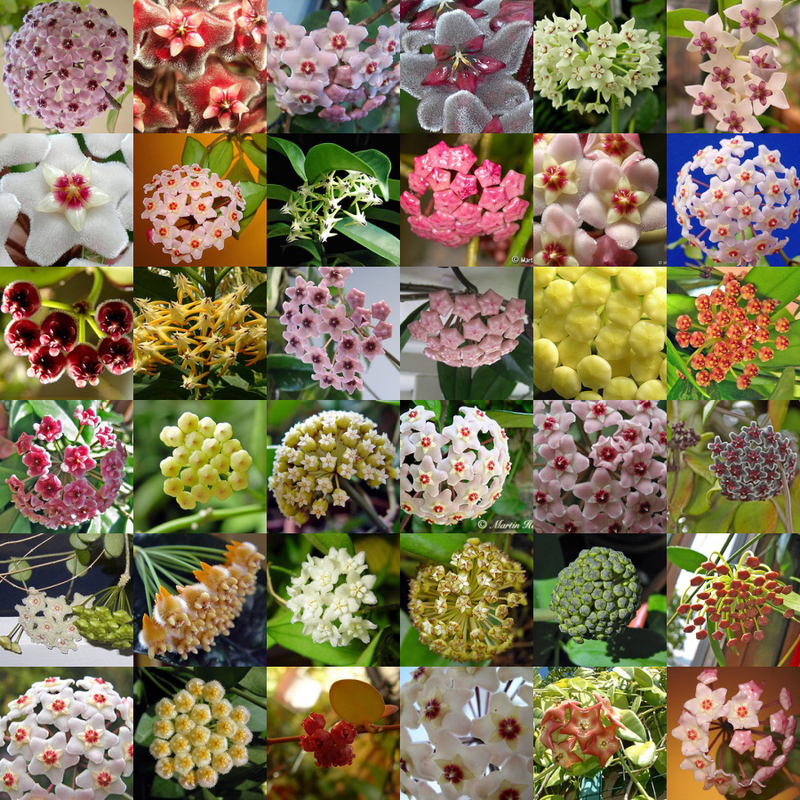 Last year I was quoted $50 from one US supplier – per plant species. Most sellers don't offer international shipping at all because phyto certificates are such a painful procedure. They're not needed once a plant has already been imported into the country. Canada Post mailing from Saskatchewan won't be anywhere near that much. If you like this post rewet it using the link at top right, or share it using any of the links below. What you didn't mention was the amazing scent the exude in the night. Wonderful!